Location: Central Niagara County, under the City of Lockport. Culvert Cascade is located on Eighteenmile Creek, under the City of Lockport. The creek gets its name from the fact that the mouth of the creek is located 18 miles east of the mouth of the Niagara River. Several tributaries start on top of the Niagara Escarpment, flow over it and continue their northward journey to Lake Ontario. One branch of Eighteenmile Creek flows through the east side of the City of Lockport. As the city began to expand the ravine of this branch became a hindrance to travel and development. A stone arched culvert was built over the creek and the ravine was filled in. Streets and homes were soon constructed on top of the fill and culvert. A newer rectangular shaped concrete addition extended the length of the culvert to around 3,650 feet. From the start of the culvert to its end, Eighteenmile Creek drops roughly 120 feet in elevation. 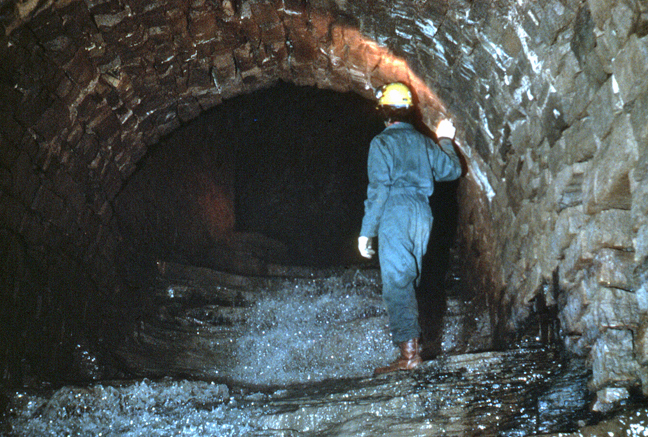 In 1984 two friends and I explored most of the culvert looking for an entrance to the Lockport Cave. PLEASE DO NOT ATTEMPT TO ENTER THE CULVERT. It is certainly illegal and a very dangerous place. The photo to the right was taken near the point where the old stone arch section and newer concrete section meet. Here the culvert begins to make a northwards turn. 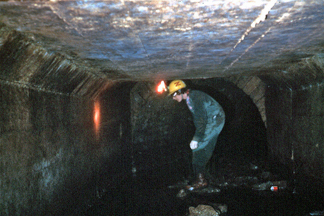 The photo above shows the upper portion of Culvert Cascade. I did not make it to the bottom of the cascade. My estimate as to the total height of the cascade is 50 feet. The bedrock is Rochester Shale. It is believed that the cascade is located under the parking lot for St. John's Church and is about 25 feet below it. The Eighteenmile Creek culvert ends just south of the Erie Canal in Josephine Carveth Packet Park. Here the waters of Eighteenmile Creek mix with overflow from the canal and then flow under the canal through Culvert No. 125. On the northern side of the canal the creek rushes through a small set of rapids near some interesting concrete ruins.